Amber Lloyd started her career in the hospitality arts at 14, where she worked along-side diner veterans in her home town of Oxford, MS. Originally traveling to Tennessee in search of an architecture degree; she continued to work in the hospitality industry and subsequently fell in love with cooking as a life. Lloyd’s latest venture is joining the Chi Omega Pi Chapter as their Private Chef, where she strives to make an impact in the development of its new culinary program. As a chef, her vision is “to subtly bring the common pleasure of sharing the dining table to a higher level with a reverence for the culinary bounty of regional ingredients, tradition, and the rhythm of the seasons”. Lloyd’s culinary interests blend her traditional southern roots with a global perspective gained through extensive and passionate study. Early on, her interest in cuisine became quite serious, leading her to pursue the, time-tested, apprenticeship route in culinary arts from graduates of acclaimed schools such as The Culinary Institute of America, New England Culinary Institute, Le Cordon Bleu, Asheville-Buncombe College, Sullivan College, and Johnson & Wales University. During that time, she has amassed numerous accolades, proving her mettle in Knoxville, appearing on television and in print, supporting fund raisers, teaching classes at UT, and serving as one of the cornerstones of the fine dining and private chef scene. 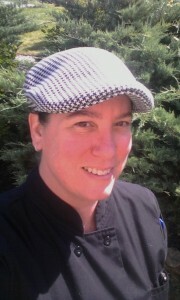 Lloyd’s career path has lead her through an array of culinary arenas, including The Orangery, Knoxville’s only 4 diamond restaurant, RT Lodge, the award-winning By the Tracks Bistro, Club Le Conte, Blue Moon Bakery, Rosa’s Catering, The Sunspot vegetarian restaurant, and Tuscany il Ristorante fresh pasta restaurant. She has cooked for Food Network executives, Scripps Networks, Bush’s Beans, Pilot Oil Corporation, and several locally distinguished families. Lloyd demonstrates a broad collection of talents, including her particularly unique mastery of handcrafting artisanal foodstuffs and elevating comfort food. Beyond fine dining, Lloyd has a solid reputation for orchestrating grand events. Amber, Thank you so much for all you have done. Your food, your tastes have been amazing, far better than we even envisioned. Everyone has raved incessantly about it and you have made our experience here complete. Thank you again. I cannot put into words how wonderful you made our Retreat at the RT Lodge. The cooking challenge was a huge success, beyond what we had hoped. Each and every course of each and every meal was amazing. Despite the rain, the accommodations and “setting” worked like a charm. But, most of all each and every member of the staff was incredibly helpful, friendly and gracious. We hope to come back again soon. Amber…you are unbelievably talented….left us walking away realizing the impact that what you do reverberates to the well being of many people who are touched by your gift as well as your fun and creative spirit.